A warm welcome to the August Creative Derbyshire newsletter, bringing you the latest about the Creative Derbyshire programme and other news of interest to the creative industries sector in Derbyshire. Our ‘Meet the Curator’ returns for a second year. The event is unique, bringing together curators, programmers and buyers with artists and makers. It is an opportunity for new and emerging artists to meet gallery curators face to face for advice and guidance on how to get work selected for exhibitions, commissions and retail. The first ‘Meet the Curator’ took place last year with over 100 artists attending and representation from 20 galleries, venues, festivals and commercial retailers that support visual arts and craft. Last year’s event was an overwhelming success, providing a platform for artists to get greater exposure, develop their practice and grow their businesses. As a result of the event a large proportion of artists got work exhibited in galleries, venues and events across Derbyshire and beyond. For an artist, making the first approach to a gallery can be a daunting prospect. 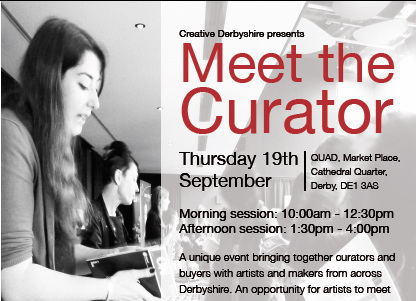 Creative Derbyshire is offering this workshop to help artists in preparing their pitch for Meet the Curator and approaching potential customers. The session will give artists useful tips and ideas on how to be considered for exhibitions, sales and commissioning opportunities. The workshop will be led by creative mentor Rachael Chambers of Ferrers Gallery and Contemporary Craft Editor of Craft&Design magazine. We are offering 2 dates for the training workshop: Friday 6 September in Ripley and Monday 9 September in Matlock. In a search for the county’s top creative talent and to celebrate innovation in the arts and creative sector, Creative Derbyshire is sponsoring the Creative Innovation Award as part of the Derbyshire Times Business Awards for the second year running. The winning creative business will be recognised at a glittering bash at the Proact Stadium in Chesterfield on November 21st. The award will go to the creative business that has shown the highest level of innovation in developing their business. This will include innovation in areas such as researching and developing new artistic products and services, using new technology to improve business practices and communicate with their customers or using creativity as a solution to practical problems. The winning business will have a proven track record of innovation and will be able to demonstrate how it has transformed their business. Nominations to the Derbyshire Times Business Awards may come from entering your own organisation for an award or by nominating a third party. The deadline for nominations is Thursday 5th September and we are keen to see as many businesses from Derbyshire nominated as possible. Click here for further information and to download the nomination form. A new business support portal, “The Business Advice Website” has been launched to help businesses access arrange of support on key issues. The site has been funded by the D2N2 Local Enterprise Partnership and the Derbyshire and Nottinghamshire Chamber of Commerce. The site is designed to help identify local business support information to aid developing a business or starting a new business in Derbyshire and Nottinghamshire as well as providing links to key national sources of information and support across the country. Creative Derbyshire is working in partnership with the Chatsworth Road Festival in Chesterfield to bring you the latest Creative Industries Roadshow which has been touring the County over the past few months. The event is FREE and aimed at artists and creative businesses. It doesn’t matter if you a new, emerging or established creative business, the event is intended to provide you with information to help your business develop and grow and signpost you to other areas of support. There will be a chance to network as well as bite-sized sessions offering tips for getting national media coverage. Drinks and a buffet will be provided. The event takes place on Tuesday 8th October at 4.30pm – 6.30pm at St Thomas’ Centre, Chatsworth Road, Chesterfield. Click here to book your free place.